In honor of the set's 55th anniversary, 2017 Topps Mars Attacks The Revenge brings the next installment of the alien story to the masses. 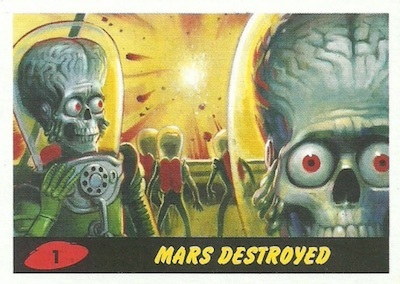 Set five years after the events of 1962 Topps Mars Attacks, every hobby box set includes one sketch, one other hit, the full base set, and 25 parallels. Offering the direct sequel to the '62 set, collectors can find 110 base cards split into two groups. 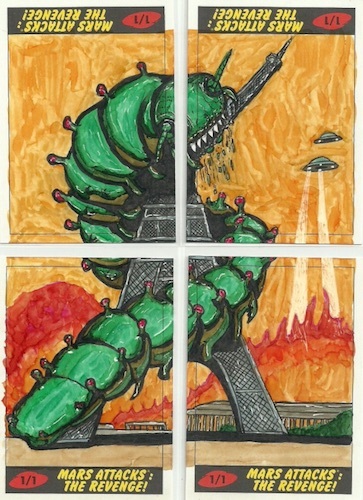 The first 55 cards are colored drawings that push the plot along, while the remaining 55 cards are pencil are reprints of the sketches used in the creation of the set. Gary Carlson supplies the text and Brent Engstrom, Fred Harper and Layron DeJarnette provide the artwork. In addition to 25 Emerald Green parallels per hobby box, 2017 Topps Mars Attacks The Revenge also features other limited parallels, including Yellow (#/199), Red (#/99), Black (#/55), Bronze (#/25), Silver (#/10), and Gold (#/2). 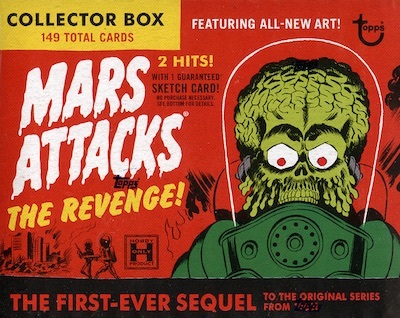 Among several options, 2017 Topps Mars Attacks The Revenge offers one Sketch card per box. Beyond the standard hand-drawn cards are die-cut Shaped Sketch, fold-out Panoramic Sketch, and Loaded Puzzle Sketch inserts, which utilize four regular sketches to form one larger image. Commemorative Medallions relics display either an alien spacecraft or ray gun with limited parallels. Mirroring the base set are the Artist Autograph cards and Len Brown Co-Creator Autographs. Brown was the original writer for the 1962 set. 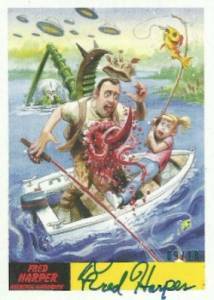 Finally, Printing Plates cover the 55 painted illustrations with one-of-one Black, Cyan, Magenta and Yellow editions. 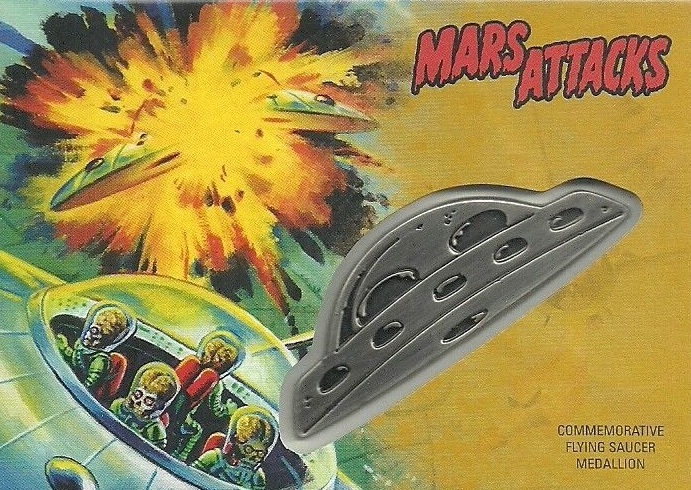 Buy Mars Attacks: The Revenge Collector Boxes direct from Topps. 110 cards, including 55 painted and 55 penciled. Shop full base sets on eBay. PARALLEL CARDS: Emerald Green (25 per box), Yellow #/199, Red #/99, Black #/55, Bronze #/25, Silver #/10, Gold #/2, Printing Plates 1/1 (Painted cards only). 4 Landing on "Mars II"
P-4 Landing on "Mars II"
110 cards. Serial numbered #/10. Shop on eBay. 110 cards. Serial numbered #/10. 20 cards. Serial numbered #/55. Shop on eBay. PARALLEL CARDS: Silver #/15, Gold #/2. 1 per box. Shop sketch cards on eBay.